As with the proverbial canary carried by miners, birds serve as an indicator of the health of our environment. Many common species have experienced significant population declines within the last 40 years. Suggested causes include habitat loss and climate change, however to fully understand bird distribution relative to the environment, extensive data are needed. Through a collaboration of DataONE and multiple partners, bird occurrence data collected by citizen scientists has been combined with land use data to allow researchers to map over 300 bird species against important environmental factors. With this information, they were able to more accurately assess the degree of protection required for each species and the responsibility of public land agencies. 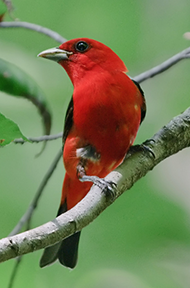 Distribution Map for the Scarlet Tanager produced using citizen science collected data within eBird by the Cornell Lab of Ornithology in collaboration with the DataONE Scientific Exploration, Visualization and Analysis Working Group. Map: Cornel Lab of Ornithology. To continue efforts like these and build upon its achievements, DataONE has recently been awarded $15 million from the National Science Foundation (NSF) as part of an accomplishment based renewal. DataONE: the Data Observation Network for Earth (www.dataone.org) is a distributed cyberinfrastructure that meets the needs of science and society for open, persistent, robust, and accessible Earth observational data. DataONE has dramatically increased the discoverability and accessibility of diverse yet interrelated Earth and environmental science data. In doing so, it has enhanced the efficiency of research and enabled scientists, policy makers and others to more easily address complex questions about our environment and our role within it. Increasingly, people the world over are facing social, technological and environmental challenges associated with climate variability, altered land use, population shifts, and changes in resource availability (e.g., food, water, and oil). Earth and environmental scientists are concerned with understanding the interactions of organisms with one another and with their physical and chemical environment. The work is interdisciplinary by nature and researchers integrate information from multiple fields to explore questions and propose solutions to an array of environmental problems. Researchers, policy-makers and others need access to open, available, persistent, well-described and easily discovered Earth observational data. These data form the basis for informed decision-making and wise management of resources. As Ecology evolves into a more data-intensive science, the ability to discover, integrate and analyze massive amounts of disparate information becomes critical, alongside a requirement to equip researchers with the skills necessary to manage data effectively. Founded in 2009 by the National Science Foundation (NSF), DataONE was designed to provide both the tools and infrastructure for organizing and serving up vast amounts of scientific data, in addition to building an engaged community and developing openly available educational resources. Accomplishments from the last five years include making over 260,000 publicly available data and metadata objects accessible through the DataONE search engine and building a growing network of 22 national and international data repositories. DataONE has published more than 74 papers, reached over 2,000 individuals via direct training events and workshops and connects with over 60,000 visitors annually via the website. DataONE has developed an Investigator Toolkit that provides users with tools supporting activities across the full research data life cycle; a dynamic in-person and web-based education program comprising workshops, online best practices, curricula, training modules and other resources; and an engaged community of users via the DataONE Users Group and through collaboration with other national and international initiatives. Establish an openly accessible online education series to support global participation and training in current techniques and perspectives. DataONE will continue to engage, educate and grow the DataONE community, seek user input to ensure intuitive, user-friendly products and services, and work to ensure the long term sustainability of DataONE services so they continue to evolve and meet needs of researchers and other stakeholders for decades to come. About DataONE: The Data Observation Network for Earth (DataONE) is the foundation of new innovative environmental science through a distributed framework and sustainable cyberinfrastructure that meets the needs of science and society for open, persistent, robust, and secure access to well-described and easily discovered Earth observational data. It is a partnership of multiple institutions with the conception, leadership, design, and implementation of DataONE a collaboration across project partners. The NSF grant is administered through the University of New Mexico and sub-award institutions include the University of California Santa Barbara, University of Tennessee Knoxville, University of California Office of the President, University of Kansas Center for Research Inc, University of Illinois Urbana-Champaign and Rensselaer Polytechnic Institute. A full list of project investigators can be found at: https://www.dataone.org/investigators.